Great christian slogan ideas inc list of the top sayings, phrases, taglines & names with picture examples. 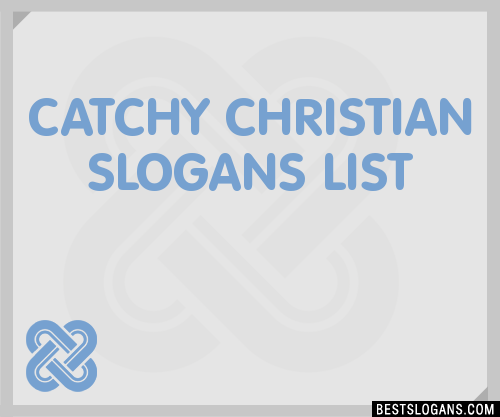 Here we've provide a compiled a list of the best christian slogan ideas, taglines, business mottos and sayings we could find. The results compiled are acquired by taking your search "christian" and breaking it down to search through our database for relevant content. 1 Dusty Bibles lead to Dirty Lives. 2 Fight truth decay - study the Bible daily. 3 God can hear you. 4 God has a great plan for your life. 5 God is stronger than my circumstances. 6 I believe in God. Never panic, just pray. 7 If God is for us, Who can be against us? 8 If you don't like the way you were born, try being born again. 9 If you cant sleep, dont count sheep. Talk to the Shepherd. 10 In the dark? Follow the Son. 12 Know God, Know Peace; No God, No Peace. 13 Running low on faith? Stop in for a fill-up. 14 Searching for a new look? Have your faith lifted here! 15 Sign broken. Message inside this Sunday. 16 Try our Sundays. They are better than Baskin-Robbins. 17 Whoever you are, My God died for you. 18 You are loved more than you will ever know. 19 Do your Best, and God will do the Rest! 20 Don't tell God how big your problem is, tell your problem how big God is.